(CBS News) Samsung announced a bevy of new devices Wednesday at the Internationale Funkausstellung (IFA 2012) trade show in Berlin. 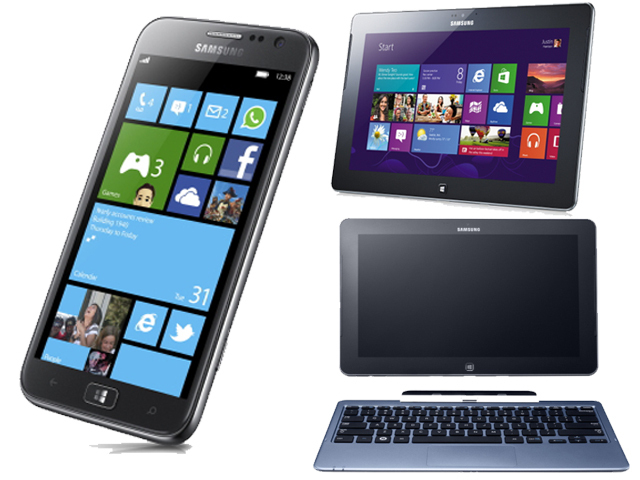 Along with the Galaxy Note II, the company unveiled the ATIV S smartphone, ATIV Tab, Series 7 Slate PC and Series 5 Ultra touch. Samsung's ATIV S is the very first Microsoft Windows 8 device. The smartphone features a 4.8-inch HD display, 1.5 gigahertz dual-core processor, HSPA+ support, 1.9-megapixel front-facing camera and a Windows 8 mobile operating system. There are no current details on price or a release date, but CNET speculates that due to the HSPA+ support and lack of LTE connectivity suggests T-Mobile may get the first release. Microsoft unveiled the Windows Phone 8 operating system in June. The iOS and Android competitor features a tiled home screen, better integration with the Windows 8 desktop operating system, removable storage and NFC technology. Samsung Slate: Is it a tablet or a laptop? Samsung is further blurring the line between laptops and tablets with the Series 5 and Series 7 Slate PCs. Samsung's Slate PCs are a Windows 8 laptop hybrid with a screen that pops off the keyboard to become a tablet. The tablet-laptop hybrid features an 11.6-inch touch screen, full multi-touch trackpad, S-Pen stylus that offers 1,024 levels of sensitivity and MediaHub software. For $749, the Series 5 features an Intel Atom Z2760 processor, 11.6-inch screen, 2GB of RAM, a 64GB solid state drive and Bluetooth 4.0. A version without a keyboard will also be available for $649. The Series 7 Slate will retail for $1,199 and features an Intel Core i5-3317U processor, 11.6-inch screen, front- and rear-facing cameras, 4GB of RAM, 128GB SSD and Bluetooth 4.0. Both Slate PCs will go on sale October 26. The Series 5 Ultra touch is a Windows 8 laptop with a touch screen and features a 10-point capacitive multi-touch screen. Hardware specifications for the $849 model include: Intel Core i5-3317U processor, 4GB of RAM, 500GB hard drive and 1,366x768-pixel display. The $799 model only differs in its processor, which will be an Intel Core i3-3217U. The Series 5 Ultra touch will also go on sale October 26. The ATIV Tab is a 10.1-inch tablet computer that features Windows RT, which is a version of Microsoft Windows 8 that is built for ARM processors. The tablet has a 1.5 GHz dual-core processor, front- and rear-facing cameras, 1,366x768-pixel display and comes in a 32GB and 64GB model. Currently, the device is intended for European markets, so there is limited information about a U.S. release date or pricing.